Live Creating Yourself. : My new home. **note: We did not pay for any of the work that was done in the apartment. 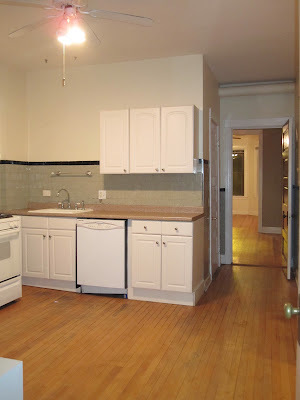 Our landlord had already hired a contractor, so we had no say in the decisions that were made (notably the kitchen and bath) aside from the color of the grey walls in the main living roms. aaaaand here it is a day after moving in. Not too shabby, eh? We bought IKEA's Expedit shelves, turned them on their side, and attached four legs to make it a bar/buffet/storage for glassware! The antler you see toward the right actually has a bottle opener on one end - can't even tell you how many compliments I got on that item alone! 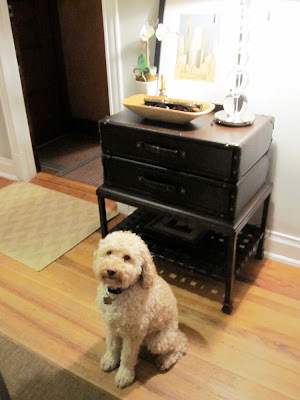 Tucker by the entryway in the dining room - we found that great trunk table at a resale shop in DC. I absolutely loooove this serving platter. It was a gift from the kids I've babysat for the past 10 years (wow - 10 years!!!). Clearly they know my taste! It's Nora Fleming china and the pink Happy New Year hat can be switched out with other decorative, festive "minis." 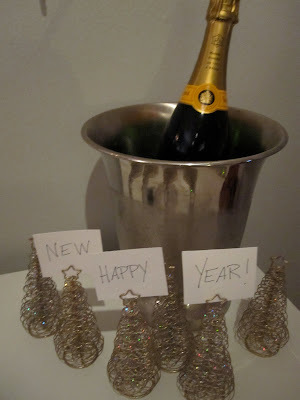 My best friend brought the fancy champagne, the bucket is on loan from my mom, and the tree nameplates were a day-after-Christmas sale purchase from Crate & Barrel. You may notice I still have to refinish the fourth dining chair. The before and afters of this CraigsList find will be it's own post next week. 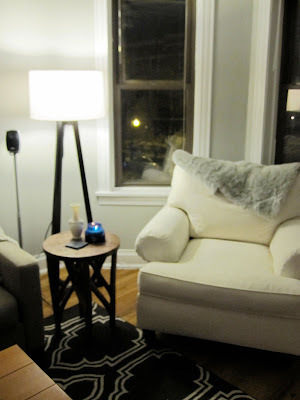 The tripod lamp, faux fur throw, couch & rug are West Elm (the two latter items were an amazing CraigsList find - I'm 24 and don't have a crazy budget. I buy used furniture. So sue me.) The awesome tree branch table is from Target, and the big chair is a hand-me-down from my mom. I love sparkly things. Wow - need to clean the windows. One day at a time, Alaina. One day at a time. So appliances came out, tiling came down, and white beadboard went up. I prefer the look of these lighter walls and will probably go back to something like that. But for now I still have to unpack the rest of my clothes. Below is the kitchen as it was set up last night. So yes, we still have a lot of work to do here, notably repaint the sunflower hued walls. But for having moved in a day ago, it gets the job done. You'll notice we bought the IKEA tulip table I love so very much. And since chairs are hella expensive, we just grabbed these awesome yellow folding chairs (also from IKEA) that were on sale for $6 a piece. They'll be great on the back deck come summertime! This looks amazing! You did such a great job. Can't wait to see pics of the rest of the apartment! What a beautiful home! You have such gorgeous taste! It looks great! I love the flow from room to room. wow, it looks amazing! i wish our craigslist was a little better! i'm totally envious of your great finds. Great Job! You have a beautiful home! You did all of that in ONE day?!?!? Whatever you are on, I would like some please :) Seriously, it looks amazing - great job!!! It looks so good! And everyone loved the party. Well done yet again. what neighborhood did you move into? i'm living in lakeview, and none of the apartments that i viewed were as beautiful as yours... of course your personal touch is really what makes it great! Thank you all so much! I put a lot of time and thought into this apartment, and I am glad it shows. It's funny now that I see things photographed, I am having an easier time deciding what I like and what needs to be changed. i.e. both rooms need curtains stat. BeekeepersDaugher: I moved near the Southport Corridor in Lakeview. Yes - it is quite the find! I am loving it and feel absolutely at home. Happy New Year! Thanks for visiting me on the holiday. Congratulations on your new home! Looks great. I have my bar in the same Expedit shelf on its side. PS I found you via desire to inspire. Gorgeous! Loooving the rug in the living room. 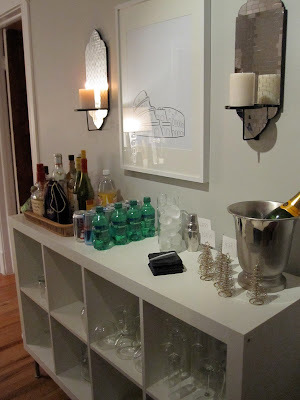 And love the idea of making the Expedit bookcase into a bar for the dining room. Happy New Year- with a start like this, it's bound to be a creative New Year for you! Oh your home is gorgeous. I can't believe you did all of that in two days!!! I better get busy:). You have great taste and I love, love your blog! Thanks for the inspiration. Happy 2010. I don't even know where to begin. Love, love, love it. Esp the bar/bookcase and trunk table. I've officially invited myself to visit. Wow, you work MUCH faster than me! The place looks great. 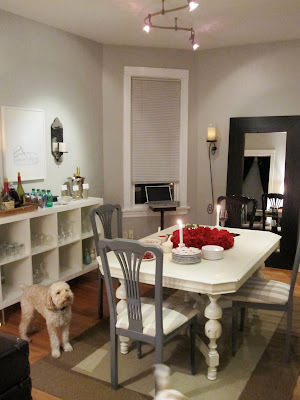 I am also feeling inspired to paint my dining chairs (which I'm not too keen on) gray. where did you get the rug in the dining room? Wow!!! I can't believe how quickly you pulled things together. I love the color you picked for the dining room chairs, and the living room looks amazing. Wow. Wow. Wow. The apartment is a great space too! Looks great! Love your rug and what you did with the bookcase. Lovely! Cannot believe you moved in so recently. It would take me 2 months to get that organized! Thanks, again, for all of your kind comments! It means so much. The dining room rug was - get this - $50 at IKEA! It's the Dragor rug, and it looks much darker online than it is in person. Very durable, dirt-resistant material. It's perfect for such a high traffic area (the dining room is in the middle of the apartment). On another note, pretty much everything in my apartment was either an IKEA, CraigsList or thrift store find. Anything new and fancy was probably a gift. I wish I had a video of my face when I scrolled down and saw your dining room before and after. I read the part about the after photo being "one day later" and then did a complete double-take-with-gasp. You're amazing, girl! I'm a little late getting to your blog, but better late than never, right?! I absolutely love your place, it's so beautiful. I'm curious though, what paint color did you use on your dining chairs? Beautiful! I'm a new follower and am loving it all, so far...especially those black old-fashion suitcases at your entryway...perfect! i just love what you did with the ikea piece!! all of it is lovely! I love the expedit shelves as bar! Did you get the legs at Ikea, too? May I ask where you got the legs for the expedit piece?